For one of the projects I am working on right now, I had to create Linked servers in my development and QA environments. The requirement was that the remote servers were different in Dev and QA but the name of the linked server had to be the same name in Dev and QA environments. 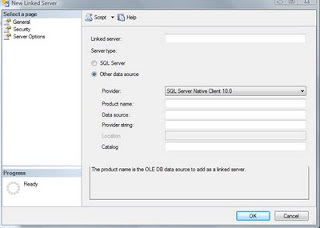 When one adds a linked server where the remote server is sql server, there are two options for server type. 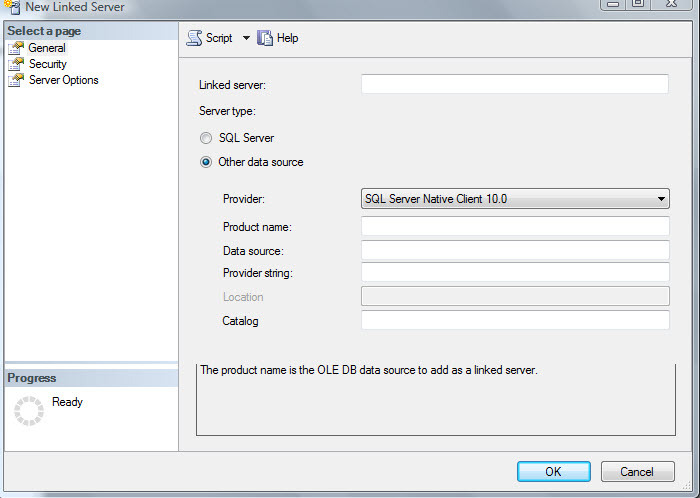 The first server type is SQL Server, the second option is Other data Source. In the first option one has to put in the remote server name( this is the actual sql server name), then click on Security in the Linked Server properties window. In the Security screen, one needs to enter the security context: this screen defines how one is going to login to the remote server. Once this done and you click OK, the linked server will be created, at the same time it also tests the connection to the remote server. In the second option Other data Source, one has to choose the type of remote server ( sql server, oracle etc...) and then provide the Product Name,Data Source and Provider String. In this option one can give a user friendly name for the name of the linked server. This is the option i followed to kep the name of the linked servers consistent across all the Dev and QA servers.